The National Science Teachers Association (NSTA) has long been an invaluable AEOP partner through their support in eCYBERMISSION and Gains in the Education of Mathematics and Science (GEMS). This year, NSTA has expanded their reach and taken on the Junior Science and Humanities Symposium (JSHS). We couldn’t be more excited to see where NSTA will take this amazing program! 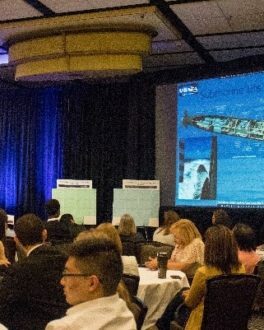 As an educator, oceanographer, administrator, White House advisor and former Under Secretary for Science at the Smithsonian Institution, NSTA Executive Director Dr. David L. Evans brings a wealth of experience working within the world of science and promoting STEM education for the next generation. Under his leadership since 2013, NSTA has thrived as a trailblazer in promoting access to quality STEM education through the release the of their strategic plan in 2015. With guiding principles including championing science literacy, valuing scientific excellence and embracing diversity, equity and respect, it’s no wonder the AEOP and NSTA partnership is such a great fit! 2019 is an exciting year for the AEOP and NSTA partnership, with NSTA’s new leadership role in JSHS. As the regional JSHS competitions conclude, NSTA is gearing up to host the National JSHS competition April 24-27 in Albuquerque, New Mexico! JSHS is no typical science fair. Using the Next Generation Science Standards (NGSS) as its guideline, JSHS challenges high school students to research cutting-edge issues directly for or on behalf of the Department of Defense, the Federal research laboratories or for advancing the nation’s scientific and technological progress. This rigorous competition invites students to present their research at one of the 48 regional competitions to compete for scholarships and nominations for the national competition. The five finalists chosen from each region are invited, all expenses paid, to present at the national competition for scholarship and cash prizes. Each year, JSHS engages over 5,000 students from across the country, challenging and inspiring our next generation of STEM leaders! JSHS is made possible through a collaborative effort between the research offices of the United States Departments of the Army, Navy and Air Force; National Science Teachers Association; and leading research universities throughout the nation. 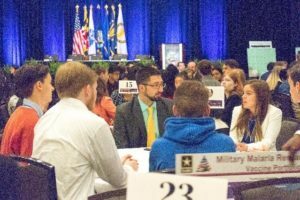 The Department of Defense generously provides funding for the National Symposium and JSHS scholarships. Learn more about JSHS here or visit the JSHS website.